MFS is a community rooted in Quaker values and dedicated to the pursuit of educational excellence for a diverse student body within an academically rigorous and balanced program emphasizing personal, ethical and spiritual growth. Be 1 of 250 to help us reach our goal in three days! Make a gift today. Jump in and be 1 of the 250+ to help us reach our goal! Help us provide today's students a great MFS experience! Lend a hand and be 1 of the 250 to help us reach our goal! Help us provide today's students a great MFS experience! Be 1 of the 250 to help us reach our goal! 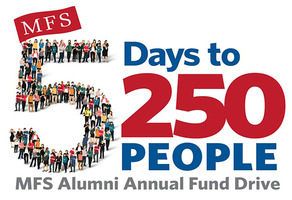 5 days for 250 alumni gifts. Help us provide today's students a great MFS experience! Make your legacy count! Give back to the school that has given us so much! Make an impact at Moorestown Friends School! Connect with other Foxes on GiveCampus!